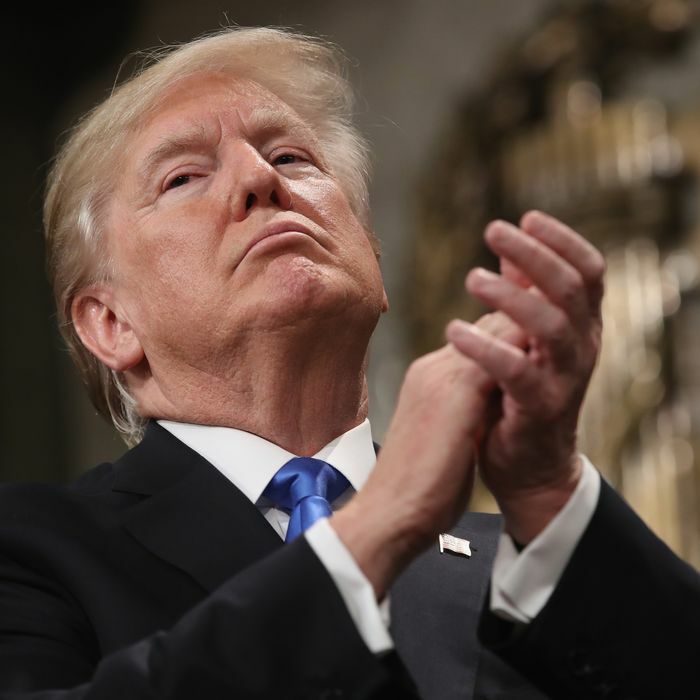 The memo may be a dud, but Trump is still applauding. Two days after the release of the Nunes memo, the only people who still consider it a conspiracy-revealing bombshell are, predictably, the same pro-Trump figures and politicians who oversold its importance in the first place. While the memo has generated a lot of media coverage, that attention has mostly focused on how the memo does not prove what House Intelligence Committee chairman Devin Nunes, President Trump, and others say it does — and how it supports, rather than invalidates, the rationale behind the investigation into Russia’s meddling in the 2016 election. But even if the memo doesn’t lay the groundwork for canceling Robert Mueller’s Russia investigation, as some of its cheerleaders clearly hoped it would, that doesn’t mean it won’t do lasting damage to the institutions now caught in Trumpworld’s covering fire. More specifically, critics have pointed out that the memo will likely harm the credibility and reputation of the FBI and larger U.S. law enforcement bureaucracy. That is surely the point: Trump and his allies object to the scrutiny he has received from the country’s law enforcement institutions, so they are conducting an unprecedented campaign to demonize and discredit those institutions and any conclusions they subsequently make against the president. The Nunes memo, at its heart, calls into question the fairness of U.S. law enforcement, since it alleges that federal law enforcement officials were able to abuse their power in order to pursue partisan political gains, particularly in the application for a FISA warrant to surveil a former adviser to the Trump campaign, Carter Page. When the F.B.I. knocks on someone’s door or appeals to the public for assistance in solving crime, the willingness of people to help is directly correlated to their opinion of the agency. When an agent working to stop a terrorist plot attempts to recruit an informant, the agent’s success in gathering critical intelligence depends on the informant’s belief that the agent is credible and trustworthy. And, as the former director, James Comey, would frequently say in underscoring the importance of high standards, whether a jury believes an agent’s testimony depends on whether it has faith in the bureau’s honesty and independence. To be effective, the F.B.I. must be believed and must maintain the support of the public it serves. The assumption among confused and dismayed F.B.I. employees is that the attacks are meant to soften the blow should the investigation by Mr. Mueller, the special counsel, lead to additional charges. However, these kinds of attacks by powerful people go beyond mere criticism — they could destroy the institution. Although those critics’ revisionist supporters claim their ire is reserved for institutional leadership and not the rank and file, it is the F.B.I. agent on the street who will be most severely affected as public support for federal law enforcement is sacrificed for partisan gain. There’s also the concern that agents might become reluctant to report information related to the president in light of these partisan attacks, as former CIA agent Robert Baer suggested during a CNN appearance on Friday. And will a juror who watches a lot of Sean Hannity now be willing to believe an FBI agent’s testimony in the courtroom? Indeed, some damage seems to have already been done to the reputation of the FBI in the minds of Republican voters, some of whom are clearly buying into the anti-FBI/Russia investigation spin. A Gallup poll taken in December found that only 49 percent of Republicans thought the Bureau was doing a good job or better, a drop of 13 points from three years ago. The results of a new Axios/SurveyMonkey poll taken on Thursday and Friday paints an even bleaker picture, with only 38 percent of Republicans saying that they currently hold a favorable view of the FBI, and 47 percent holding an unfavorable view. [A]n allegation of abuse, in the absence of actual abuse, or even more concerning in a one-sided representation of the facts for purposes of partisan gain, would constitute a dangerous, short-sighted attack on a critically valuable national security tool, in ways that could undercut our national security over the long term. The Justice Department and FBI were pretty reluctant to hand over sensitive material relevant to an ongoing investigation, and to then see it mined for items to attack the Bureau in a way they clearly regard as misleading and unfair would, obviously, tend to confirm their initial reluctance. Needless to say, you don’t want it to be an exercise in pulling teeth whenever House Permanent Select Committee on Intelligence (HPSCI) needs sensitive material to conduct its oversight responsibilities. If the agencies aren’t just worried about genuine errors being exposed, but about material being politically repurposes this way, the overseers jobs are predictably going to get a lot harder. At the end of the day, the most important aspect of the #memo is probably not its contents but the fact that it was written and released at all. Its preparation and public dissemination represent a profound betrayal of the central premise of the intelligence oversight system. That system subjects the intelligence community to detailed congressional oversight, in which the agencies turn over their most sensitive secrets to their overseers in exchange for both a secure environment in which oversight can take place and a promise that overseers will not abuse their access for partisan political purposes. In other words, they receive legitimation when they act in accordance with law and policy. Nunes, the Republican congressional leadership and Trump violated the core of that bargain over the course of the past few weeks. They revealed highly sensitive secrets by way of scoring partisan political points and delegitimizing what appears to have been lawful and appropriate intelligence community activity. It was a heavy blow to a system that has served this country well for decades, and it is one that will not be forgotten any time soon. If special counsel Robert S. Mueller III delivers a scathing report on the president and if Democrats win the House in November, it’s almost certain the House will vote to impeach. But it takes 67 votes in the Senate to remove a president. The case against the FBI that’s being assembled by Trump and his minions is not designed to convince dispassionate observers. It’s only supposed to give the thinnest of cover to true believers — and at least 34 senators — to do what they are predisposed to do anyway, i.e., protect the president at all costs. In the end, as some are already arguing, Trump’s version of the Saturday Night Massacre — referring to the infamous night of Nixon administration resignations which preceded the firing of the Watergate special prosecutor — may already be happening, only in such a slow-motion way as to protect, rather than doom, this president. In a new Politico magazine piece, Nixon biographer John A. Farrell compared and contrasted the Watergate scandal to the Russia investigation and Trump, and in doing so spoke with James Doyle, who served as the spokesman for Watergate special prosecutor Archibald Cox. In Doyle’s opinion, even if Trump triggered a Saturday Night Massacre–like event, times have changed, and because of the confusion around this scandal, the system would probably fail this time around. In other words, the obfuscation by Trump and his allies may have already succeeded.